But there are lots of other ways of grading the British Isles’ mountains and hills, some relying on height alone; others insisting on a defined prominence. The hewitts have been designated for a long time in a list compiled and maintained by Alan Dawson. But at the heart of the criteria is an imperial versus metric contradiction: to qualify, the hills in England and Wales must be at least 2,000ft but with a drop of 30m or more. To address this incongruence, a newer, all-metric list was introduced eight years ago by Dawson: the simms. These are hills of at least 600m, with a prominence of at least 30m. They can be viewed as a tidying up of the hewitt concept to align with a metric outdoors world – after all, Ordnance Survey has recorded all Britain’s heights in metres for decades. It also dispenses with the restriction of the hills to those south of the border. So, to date there are known to be 2,754 simms in the British Isles – or at least there were. Because hill sleuth Myrddyn Phillips, who likes nothing better than to stand beside his high-tech GPS gear on a windswept hill recording ultra-accurate height data, believes he has discovered a new Welsh simm, that’s also a hewitt, lurking in the Rhinog range between Harlech and Trawsfynydd in north Wales. Here’s his account of the discovery of a new member of the mountain pantheon. Part of the fun of being a hillbagger is the multitude of different classifications one has to deal with, but for those people who seldom have the opportunity to venture north to the Scottish Highlands and who enjoy visiting hills of relatively high height there are two main lists for English and also Welsh hills that give a robust criterion for separation, and these are the hewitts and the simms. A simm is a hill in Britain that is at least 600m high and has a drop of at least 30m on all sides. 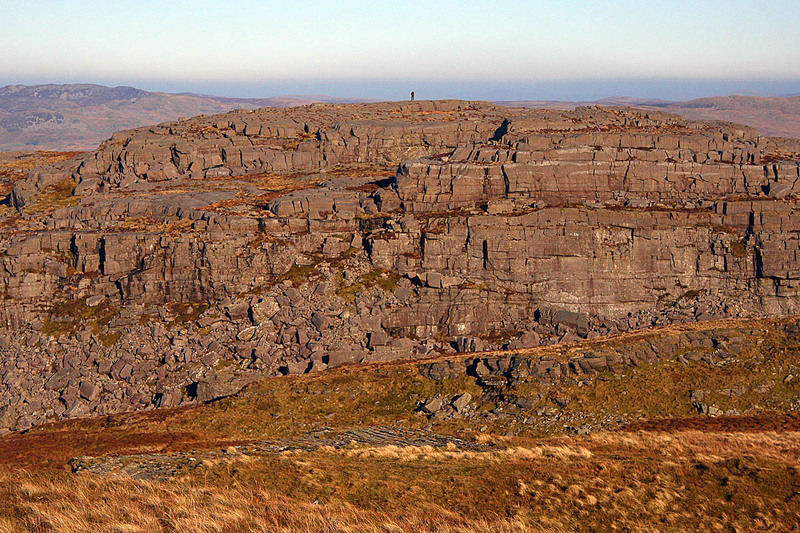 The name simm is derived from six-hundred metre mountain, though the second ‘m’ may also stand for mam, meall, mullach, moel, mynydd or monteto according to the nature and location of the hill. The simms were introduced by Alan Dawson in 2010 as a way of unifying several published lists in different height bands and regions that he had come to regard as unnecessarily complicated. There are currently 2,531 simms, including the latest addition. Only two people have climbed them all, though 11 others are known to have climbed more than 2,000 of them. Wales has 150 of these hills, including the 136 that qualify as hewitts, one of the older hill lists compiled by Alan Dawson. Although now incorporated in the simms, the hewitts are still meaningful to hillwalkers south of the border who prefer to think in terms of 2,000 feet (609.6m) rather than 600m. With a minimum of 30m of drop, any hill that qualifies for these lists is easily differentiated from other nearby hills, as it requires twice the 15m drop employed by the Nuttalls for their popular list. The scope for new simms or hewitts south of the border is not great as the number of qualifying hills is small compared to the Scottish Highlands, but there are some mighty and majestic hills that do qualify. Over the years these lists have occasionally been altered as independent and enthusiastic surveyors, including all contributors to this article, have ventured to the hills with expensive Leica or Trimble surveying equipment to measure the absolute height of many a hill. If its drop was already sufficient, all a hill had to do was break through the magic 2,000ft or 600m threshold height and a new hewitt or simm could be declared, but even this has been a rarity. Until a few days ago no Welsh hill had been added due to its drop increasing to the magical 30m required. But that trend has just been broken as a rather special rocky hill has now been included in both the hewitts and the simms. The hill’s name is Foel Penolau. 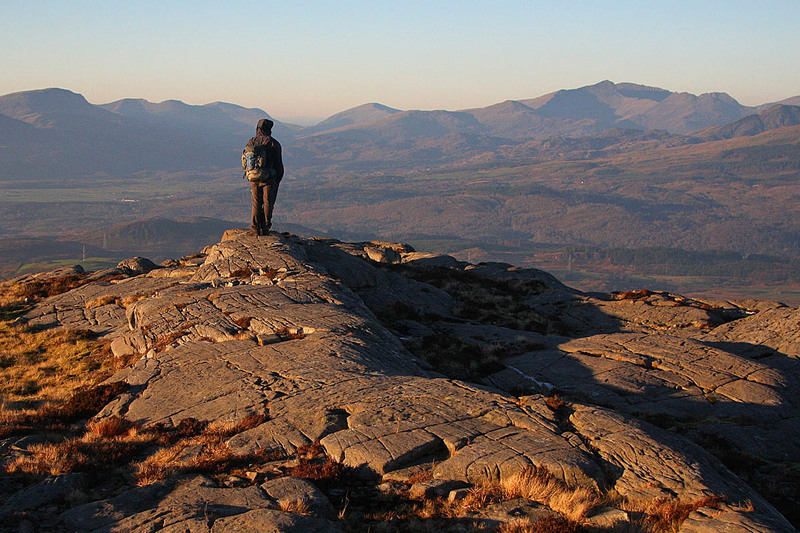 Foel Penolau is situated in the northern Rhinogydd in the heartland of Snowdonia. 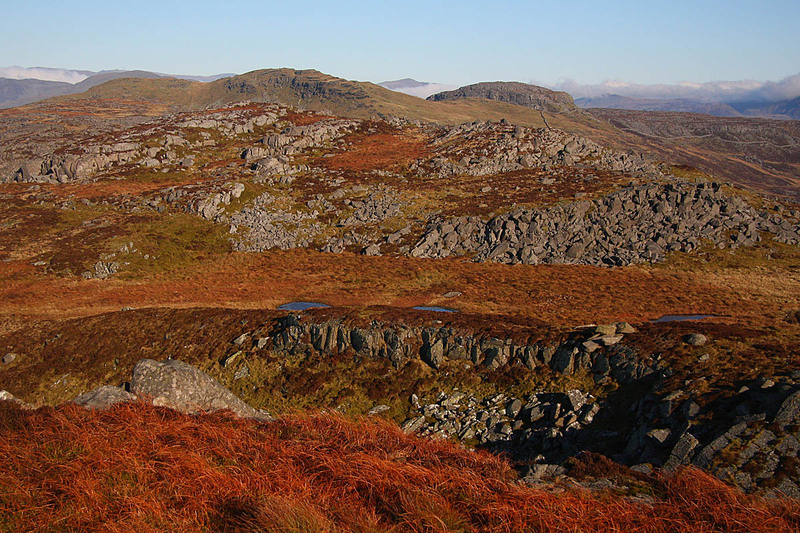 The hill range of the Rhinogydd is renowned for having a wild landscape mainly consisting of rock and heather. The northern section has few recognised access points due to the rocky nature of the ridges. These are generally complicated affairs with one up thrust of rock leading to another. This landscape is unique amongst the Welsh uplands. This hill had been on the surveying radar for a number of years, but with a listed 26m of drop it was not a priority to visit. The opportunity to do so came from Aled Williams who suggested that with a settled forecast for the following day we should visit some proper hills and he suggested the northern Rhinogydd. We were walking by 7.35am and ahead of us the ridge was under substantial clag, but with a forecast for this to break up as the morning progressed, we pressed on. As the clag slowly broke shafts of sunlight highlighted the near moor turning the immediate land golden, and slowly but surely the mist rose and when we reached the ridge a Brocken spectre within a glory foretold a good day ahead. We surveyed many hills on the way to Foel Penolau but it was this hill that needed a thorough and accurate survey as its drop value is based on an Ordnance Survey online 588m spot height, which when coupled with the twin 614m spot heights given to its two tops on contemporary Ordnance Survey maps, give the hill 26m of drop. However, a number of people have wondered whether the 588m spot height represents the true col, as nearer to the southern face of Foel Penolau is another depression which proved to be its true col. The south face of Foel Penolau is impressive and forms an almost impenetrable cliff with a large boulder field at its base. It was among these boulders that the surveys would need to be concentrated. The equipment I use to survey hills is a Trimble GeoXH 6000. This is a GNSS receiver and gives accurate results with two minutes of data collection. To push the boat out I usually gather a minimum of five minutes of data. 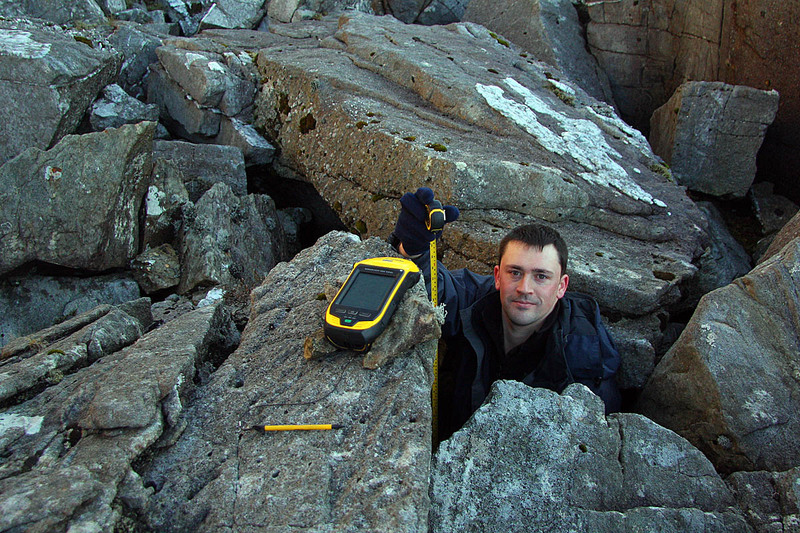 Aled and I pinpointed where our preferred critical point for the col was and set the Trimble up on one of the boulders, Aled then quickly popped down beside the boulder into a hole and with steel tape in hand measured the offset between the Trimble’s internal antenna and the solid ground at the base of the boulder. As daylight was quickly receding any further investigation of this boulder field would have to wait for another day’s survey, and we now headed toward the twin 614m map heighted tops and proceeded to take a data set from each as the sun sank forever lower casting beautiful late afternoon light upon the land. Due to the boulder field the col is complicated and ideally further data sets needed to be taken on the valley to valley traverse as it threads its way through the boulders at the base of the south face. Nine days later and with a settled forecast before the incoming westerlies blew rain and wind across Wales for many days to come, I headed back to Foel Penolau to complete the surveying task. I took a further seven data sets from the area of this hill’s col, many of which were in the boulder field. I was there beneath the south face for almost two hours setting up the Trimble and measuring offsets, noting all details relating to each survey and waiting for data to be gathered and stored. During this process mist rolled up adjacent hillsides shielding me from view, and this only finally rose as the col surveys were completed and I headed up the near cascade of boulders to the two twin tops above. All that remained was to process the data, and an interesting set of results was soon showing on my laptop screen. 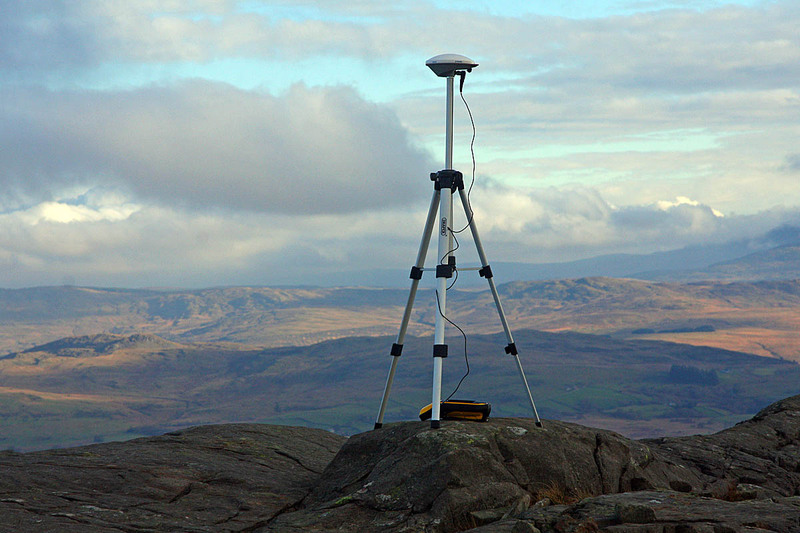 The results from surveying with the Trimble gave Foel Penolau a summit height of 614.4m with only 1mm between each top, these are positioned at SH 66145 34774 and SH 66184 34832. As a difference of 1mm lies outside the tolerance of the equipment they remain for now as twin summits. The critical point of the col came to 582.5m, giving this hill 31.9m of drop. Alan Dawson has accepted the survey results and as such Foel Penolau enters the ranks of both hewitts and simms; and it is definitely one of the best additions to date. More information on these and other relative hill lists is available on the Relative Hills of Britain website or by email. Campaigners’ survey asks: national parks, what do you think? Nice work Myrddyn and Aled, this is a lovely summit and great walk in to it.